Christmas is almost here. Are you fresh out of ideas? If you’re like me, you have no problem purchasing a gift for a child up to maybe 5 or 6. After that, it’s a struggle. Then once they hit the teen years, phew, it’s nearly impossible. Of course, electronics are always an option. However, it’s not healthy for ANYONE to be glued to these all the time. 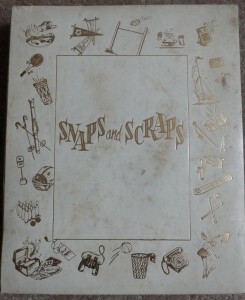 When I was a teen (MANY moons ago), I had a scrapbook and a photograph book. I put all kinds of things in my scrapbook and still love looking at it today even though it’s gone through several moves and is looking a little ratty. Hey, it’s over 40 years old…it can be a little rough. 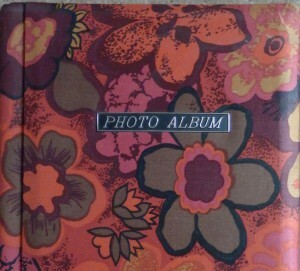 The photo album is pretty ugly — what WERE we thinking back then with those flowers? LOL. 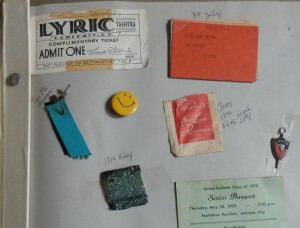 Today, through scrapbooking, we combine these two and add journaling so that we can remember what that special event meant — or why you were making that face — or how beautiful that bouquet of flowers was — or anything else that helps you relive those good times. Face it, we all have bad days when we feel down. I find that going through my scrapbook will cheer me up even though the event happened 40 years ago. It takes me back in time and who doesn’t want that sometimes. LOL. So, if you have a child on your list past toddler stage but pre teen, you might think about the American Girl scrapbooking kit. Michaels always has the 40% off coupons. They can be purchased there or if you don’t want to venture out, Amazon will ship it to your door. 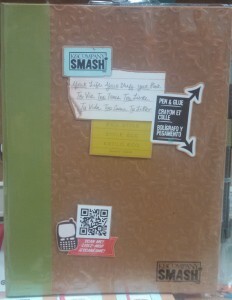 For those teens on your list, the smash books are popular. 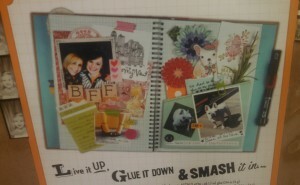 They not only put photos in them, but they draw in them or use them as small scrapbooks. I did one over the summer. I messed it up by talking too much while I was doing it. I started creating the pages then realized I was doing the whole thing upside down. I could just say I planned it that way. That’s the nice thing about creative endeavors — there are no mistakes that can’t be covered somehow. I bet Picasso made a lot of mistakes. I know these ideas seem a little biased as scrapbooking is my passion but I realized over Thanksgiving that my grandchildren enjoy creating. They get pleasure from seeing what they’ve done and of course, I love watching their eyes light up. Now matter what you decide, I wish you all a VERY Merry Christmas………..and don’t forget to take photos. LOL. Please let me know what you think and share your holiday memories with me. That’s a terrific idea, especially if the children are interested in art projects. They will have such a sense of accomplishment AND the start of a great hobby for years to come. Thank You for your comment, Cheryl. I think art is good for kids. Perhaps I’m biased but anything that makes them work both sides of their brain is beneficial.